Once again this is a topic I knew absolutely nothing about a short couple of years ago. I had no idea there were medical supply companies or that needed supplies would get delivered to your door. I also had no clue HOW MANY supplies were required to take care of one child. Zachary receives deliveries each month from 3 different medical suppliers. The biggest delivery we receive are the supplies for his g-tube feedings. Boxes and boxes of formula, feeding bags, tube extensions, gauze, syringes, and more fill the closet in Zachary's bedroom. The second delivery arriving usually a week later is boxes of diapers, diaper liners, bed underpads, and diaper cream. What an AMAZING blessing! Typically when your special needs child turns 3 or 4 insurance will pay for diapers and diapering supplies. Zachary's pediatrician got the ball rolling the prescription for these. Growth hormone is usually the final delivery each month. The medicine arrives on ice packs along with the needed needles and alcohol prep pads. I'm guessing I'm not the only one who find's it super easy to bring the delivery boxes in the house and then get busy with the rest of the daily tasks and leave the boxes sitting in the living room. My first tip is to deal with the medical supplies and boxes right away. 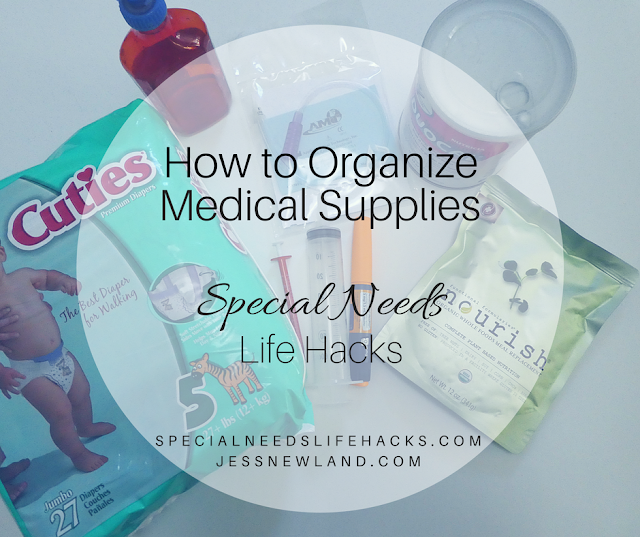 On our SNLH Webinar this week, Melissa and I are shared our experiences with medical supply companies and tackling organizing the literal piles of boxes of supplies that arrive each month. Missed previous episodes? Visit the Special Needs Life Hacks YourTube channel.